Plate#91: View of the Conewago Gorge by photographer William H. Rau, during his first photographic commission with the Pennsylvania Railroad to illustrate the destinations and scenery along the system. Collection of American Premier Underwriters, Inc.
Leaving Royalton behind the main line begins a sustained climb to Elizabethtown with a ruling grade of .84%. Four miles east from the junction of the Royalton Branch the main line, running on the alignment of the former Harrisburg, Portsmouth, Mt Joy and Lancaster Railroad crosses the Conewago Creek valley. Lenape for “At the Rapids”, the Conewago is actually two creeks of the same name: One running from the west to the Susquehanna River in York County the other coming from the east from the headwaters of Lake Conewago in Mt Gretna, Lebanon County, Pennsylvania to the Susquehanna near the village of Falmouth. Pennsylvania Railroad Track Chart showing the grade and track profile between Highspire and Rheems. Note the junction with the Lebanon Branch at approximately Milepost 90 in Conewago, this branch had an interesting history connected with the Coleman Family iron dynasty of the late 1800's. Excerpts of track charts collection Keystone Crossings. (Inset) Post card view of the 1885 Cornwall and Lebanon Railroad station in Lebanon, Pennsylvania designed by noted architect George Watson Hewitt. This building survives today and is on the National Register of Historic Places. By the 1840’s iron forges to the north of Mt. Gretna owned by various descendants of Robert Coleman flourished in Lebanon with transportation access provided primarily by way of the Union Canal. 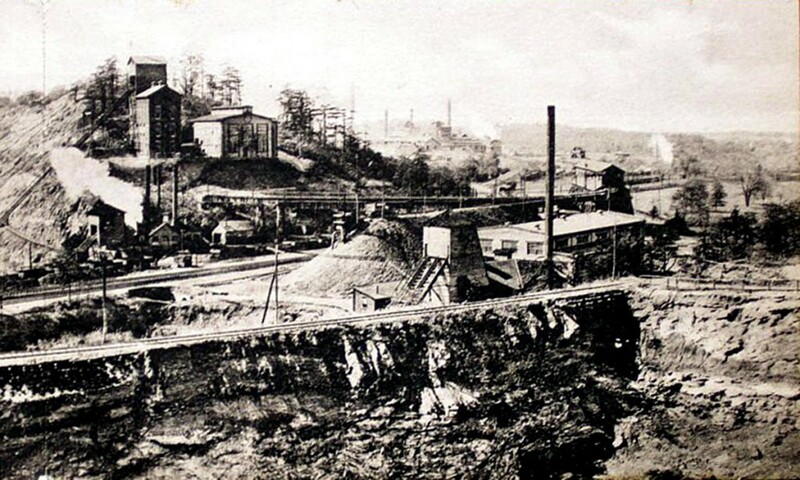 The area’s close proximity to the Anthracite Regions, the Cornwall iron ore hills, an abundance of timber for charcoal/ coke production and local limestone quarries provided the catalyst for growth and development of an industry, which would become the backbone of Lebanon County and the Commonwealth of PA. To feed the forges William Coleman and cousin George Dawson Coleman constructed the North Lebanon Railroad In 1853 connecting the ore hills and forges near Cornwall to the Union Canal landings in Lebanon. By 1870 the railroad was renamed the Cornwall Railroad, interchanging with the Lebanon Valley Railroad, a line that was absorbed by the Philadelphia and Reading. As mining progressed at the Cornwall Ore Hills Company another line, The Spiral Railroad was constructed in Cornwall to facilitate moving material from the pit mines, loading the raw ore into Cornwall RR rail cars. The material would then head out to Lebanon for processing and concentration to be used in local iron production. By 1884 the Cornwall RR would also construct another route the Cornwall and Mount Hope Railroad, providing access to the P&R’s Reading and Columbia Branch allowing interchange freight and connecting passenger services via Manheim. For a long time the Cornwall Railroad ran with no competition until 1883 when Robert H Coleman, a cousin to William Freeman the president of the Cornwall Railroad and son to the founder to the North Lebanon Railroad, would open a competing railroad, the Cornwall and Lebanon, creating considerable angst between the two operations. Running southwest from Lebanon to Cornwall then onto the resort town of Mt. Gretna following the Conewago Creek Valley, the new line provided a direct connection to the Pennsylvania Railroad in Conewago, opening markets in Philadelphia, Pittsburgh and points west. Consequently in the following year, the aging Cornwall Furnaces ceased production, unable to compete with larger mills like Johnstown, Bethlehem and Steelton. Lackawanna Iron and Steel purchased the facilities and iron mines in 1894, later becoming a subsidiary of Bethlehem Steel whom operated the mines into the 1970’s. Postcard view of the Cornwall iron ore mines circa 1922. The railroad in the image likely to be the Spiral Railroad, providing access to the three ore bearing hills at the mine site which then fed the material to both the Cornwall Railroad and Cornwall & Lebanon Railroads. Though the forges shut down Robert H. Coleman’s net worth in the 1880s was over 30 million dollars, owing other interests in the iron business. However his investment in the failed Jacksonville, Tampa and Key West Railroad Railway in Florida and the Financial Panic of 1893 Coleman would lose everything and his assets defaulted to debtors who took control of the Cornwall and Lebanon Railroad. Providing an ideal operation to tap the remaining ore deposits, Pennsylvania Railroad’s board of directors authorized purchase of railroad on Mar. 12, 1913 from Lackawanna Steel Company for $1.84 million; officially merging w the PRR April 15th 1918. The route continued to operate through the Penn Central until Hurricane Agnes wiped out considerable pieces of right of way and flooded the remaining pit mines operating in Cornwall.